“Battle for Freedom,” the final episode of Jason of Star Command (1978 – 1979) really pulls out all the stops. The episode features several new miniatures, a grand space battle (with more space craft per shot than we’ve seen before…), some terrific character interaction, and, finally, even a sense of resolution. In this installment, Commander Stone (John Russell) is intercepted by Dragos while en route to Fleet Command to accept a medal for his outstanding service. Dragos holds Stone hostage and informs Jason, now acting Commander of Star Command, that Stone will not be released unless Jason cedes the peaceful planet Chryton to the tyrant. Chryton’s prime consul, Jo-neen, visiting Star Command, officially requests protection for her planet. 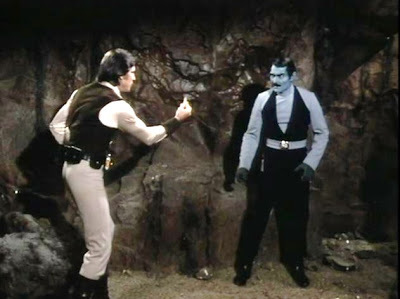 Jason attempts to stall Dragos, leaving Parsafoot in command while he searches the D-2 Star System for Stone. Unfortunately, the planets in that system have strange effects on humanoids. Jason and Samantha take an antidote created by Parsafoot and head out to rescue their superior officer. 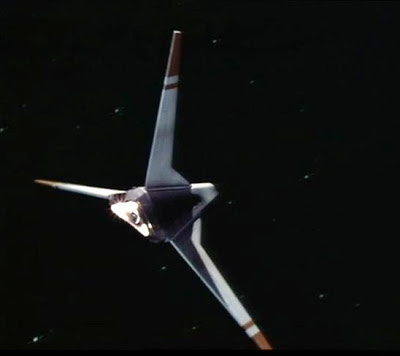 As Jason, Samantha and Commander Stone leave the planet in the D2 system, Parsafoot launches a fleet of Star Command drones to meet Dragos’ attack fleet in space and defend Chryton. It’s a rout, but the defeated Dragos has one last trick up his sleeve. You might expect a Saturday morning’s kid show, at the end of a long season, to do a bottle show or something rather modest, having run out of budgetary resources. Instead, Jason of Star Command goes out in grand style, with a whole host of new special effects and miniatures. 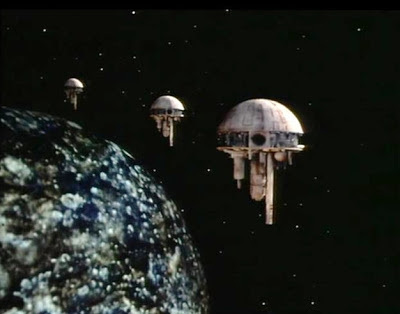 For the first time, we see the unmanned Star Command drones, and by the half-dozen, no less. 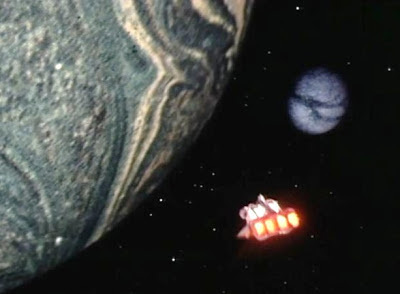 We also see Dragos’ fearsome battle stations in orbit of Chryton. And, of course, we get the final tango between the deadly Dragonstar and Jason’s zippy Star-Fire. There are more miniature shots – and of greater complexity – in this twenty-minute segment than in the last several episodes of the season put together. Although certainly the intention would have been to have another season of episodes, “Battle for Freedom” provides a nice sense of closure to the Saturday morning series. The socially-inept Parsafoot begins a romantic relationship with Jo-neen, and more importantly, Jason and Commander Stone finally seem comfortable with another. They have some nice banter in “Battle for Freedom,” and come to an acceptance, you might say, of their different way of doing things. They started out as uncomfortable allies at the beginning of season two, and end the same season with a strong sense of mutual respect. In this regard, the cast change from James Doohan as Commander Canarvin to John Russell as Commander Stone really works in the series’ favor. So much so, in fact, I’m inclined to agree with Jason’s explicit assessment: Stone is the better commander. And, of course, Dragos is finally defeated in this valedictory episode. As the villain disappears, shouting maniacally “some day…Jason…” it’s clear he could return, had the series come back. But as the final episode of the show, the defeat of Dragos also plays as a final victory for the heroes. The scourge of the universe is gone. Watching Jason of Star Command today, it never lets you forget it was made for children. The stories are simple and straight-forward, so much so that they become rather boring at times for an adult. Yet -- from time to time -- the character interaction is really great, particularly as it pertains to Stone and Jason. More to the point, the special effects remain astonishing examples of 1970s post-Star Wars state of the art. They compare favorably, in fact, with prime time efforts such as Battlestar Galactica (1978-1979) and Buck Rogers in the 25th Century (1979-1981). I can’t say I wouldn’t have appreciated more thematic depth in a lot of these second season episodes, but again…these shows were designed for kids, and they're fun. Adios, Jason! John excellent review of the final episode “Battle for Freedom” of the series. As a final episode, it delivers all the best of the series. As usual the special effects miniatures, including the Star Command Drones, rivals all the prime-time. The Star Command Drones adds to the production designs and yet another reason why I wanted a Space Academy-Star Command Technical Manual book to have been published. Thank you for all of your write ups on this series; I'm actually sorry you have reached the end of it. Though I've known of the show for years, I never saw it (it's just barely ahead of my time by its dates, but I guess it never got the reruns of other, even earlier, Filmation shows). Because I knew its connection to [i]Space Academy[/i], I have thought of this as more of a "kid-driven" show, and pictured Jason as a younger character (though I've seen pictures, so that just shows my cognitive disconnect), but it certainly sounds like an exciting swashbuckling show. I guess I should track this one down. Thank you for the reviews. Hugh: For some reason I never saw an episode of the show either, even though I was born in 1970 which makes me exactly the right age for it! I remember seeing promos for it (and Space Academy) but never caught either show. It must be that I had something going on outside the house regularly during their airtime. Nice to be reminded of it again. 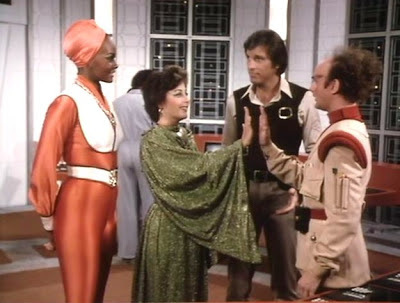 Oddly enough, I specifically remember seeing at least one episode of The Starlost as one of the group of kids in the rec room at a party all our parents were attending. In that case John's review reminding me of a series didn't pan out so well: just like him I found it almost tragic in how promising it started out and how far it fell. The Star Command and Space Academy shows actually turned out to be more watchable now. The special effects really were impressive and as a kid it was the space ship design that could always make me love a show no matter the rest of its flaws as long as the ships were cool. I think it was because my friends and I would use the world of a show to make up our own adventures when playing.